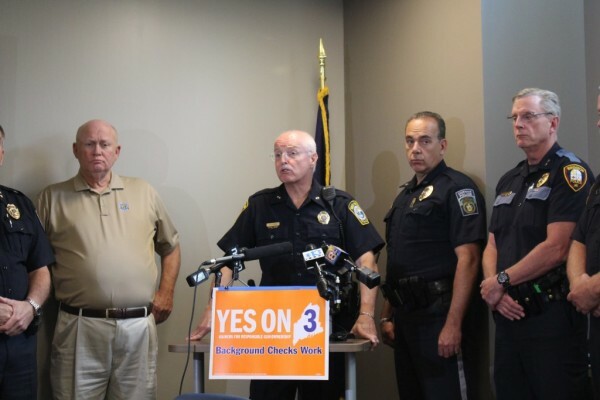 In the company of other law enforcement leaders, South Portland police Chief Ed Googins announced the Maine Chiefs of Police Association's support for Question 3, which would tighten gun control in the state, on Wednesday. GORHAM Maine — The Maine Chiefs of Police Association on Thursday endorsed voting in favor of a ballot question that would tighten state gun control laws at an event organized by a group advocating for the initiative. The association’s board recently voted unanimously to support the ballot measure, which would require background checks prior to the private sale or transfer of guns in most instances, Executive Director Robert Schwartz said. The group claims membership of more than 350 active and retired chiefs and sheriffs across the state. On Wednesday seven southern Maine police chiefs stood with South Portland Chief Edward Googins as he announced the law enforcement leaders’ support for Question 3. Under current state law, background checks are required when buying a gun from a federally licensed firearm dealer, who must run the name of the purchaser through an FBI criminal database. But a background check is not required to purchase a gun from a private seller, including online merchants and classified shoppers like Uncle Henry’s. Critics, including Mainers for Responsible Gun Ownership, which helped organized today’s announcement, argue that these loopholes enable people who are legally barred from purchasing firearms to buy them anyway. But opponents of the ballot initiative, such as the Sportsman’s Alliance of Maine, claim the measure would hinder hunting in the state and is unnecessary given Maine’s low crime rate. Trahan contended that the proposed law is ill designed would place undue burden on people who want to lend or borrow guns. He also claimed it was inappropriate for Googins to weigh in on the issue in his capacity as a police chief, given that he also sits on the board of Maine Citizens Against Handgun Violence. In endorsing Question 3, Googins said the legal change would help reduce gun trafficking, which he said is a problem “we know exists here in Maine” and that states with broad background checks see less gun violence against police and fewer women shot by their spouse or partner. Maine has low overall rates of violent crime, but it ranked ninth in the nation for rate of women killed by men according to a recent study from a group that advocates for gun control. Four of the 10 women killed in 2013, the most recent year for which data were available, were shot, according to the report. The South Portland chief said that passing Question 3 will make Maine safer without limiting lawful gun ownership. “If you are legally allowed to own a gun, this law does not prevent that,” Googins said. Following a string of prominent mass shootings, gun control has come to play a more prominent role in elections across the country. Support for Question 3 in Maine has been significantly bankrolled by billionaire Michael Bloomberg. Through the group Everytown for Gun Safety, the former New York City mayor has been pumping money into gun control initiatives across the country, including nearly $3.6 million in Maine since 2015. Schwartz said Maine police chiefs “are proud to stand together to protect the residents of our rural state,” though there were no officers from Maine’s more rural and conservative 2nd Congressional District at the event. There is no equivalent event scheduled in northern Maine, according to David Farmer of Mainers for Responsible Gun Ownership. But the group plans to air an ad supporting Question 3 featuring the Caribou police chief in the coming weeks, he said.